To most this is just another entry in Graham’s daily record. 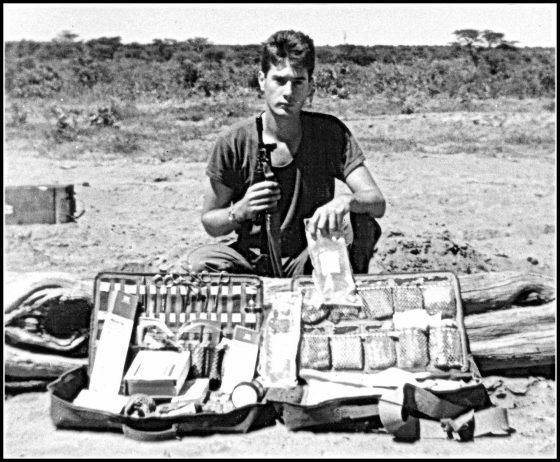 For many of us Medic Veterans or fellow ranks who read these entries we realize that we were there, often first on the scene. We were the kid that stepped into the drama and took responsibility. To me it was my first serious blooding in the field as an Ops Medic after the experiences of A&E in the East Rand Townships. When I read this excerpt it didn’t bring back any fresh memory because this is the one incident that is never far from the surface. Most are thankfully hidden deep in the psyche or forgotten. They may yet bleed out from the pen. Tuesday 16th August was a regular hot and red-dust day on the firing range at Rooisloot training ground nearby 2 Special Service Battalion in Zeerust. 2nd phase training was ongoing for D Squadron, the Squadron I would accompany to the Border later in the year. Young men training on the big guns; 90mm, assorted incendiaries and the .50 Browning. I was alone on duty and expecting an incident. There was a lot of scope for injury and worse amongst these kids. My stomach was tight at the prospect and from dawn to dusk my temper was short. Perhaps another hand mangled by a piece of old ordnance picked up by a foolish troopie or a secondary detonation from a shell inside a turret. God forbid there should be a fatality. My Glasgow sense of humour had failed after two weeks on duty in this dust bowl amid an atmosphere of severe discipline and presbyterian fatalism. “58 Juliet-58 Juliet / 30 Alpha oor…..medic….” The alarm call came across the radio as I sat daydreaming and deafened on the range. But for the noise and burning wrecks of targets in the distance this could have been a pleasant spot to sit and view Springbok and Kudu or just scratch your balls. It may be just that almost 30 years on. I was rushed away in a Samil 20 to the area where driver training was ongoing further into the Marico bush. It had taken some time to locate the incident. Why had nobody stepped in yet ? The Eland 90 lay on its turret on a 45 degree slope with a group of troops huddled up the slope directing us in. The facts remain unclear to this day but it would appear that the driver stalled on an incline, allegedly kicked in the back for his poor performance, and the Noddy slid back and tipped down the slope. A fatal kick. One complete roll with Van Rooyen unable to duck into the turret and then a partial roll coming to rest at an angle with just enough space to crawl under the turret. I was under the Eland after a sprint down the hill, pausing only to check I still had the adrenaline, solu-cortef, sosegon and drip stuffed into my pockets. The bare minimum required which already appeared optimistic. I was soon covered in leaking fuel that had mingled with the smell of Staff Van Rooyen’s vomit and the red dust. I can still recall that odour. He was half out of the Commanders hatch and crushed beyond recognition. After a swift assessment and an attempt to find an airway to clear, more from habit than any hope of saving him, it was now time to concentrate on saving myself. Not for the last time. And not under fire. Here lay what remained of a Zeerust legend, a very popular man. A legend on the rugby ground and in the Mess Bar. Death had probably been instant and he was now beyond the call of his pregnant wife waiting at home. It was their wedding anniversary. I had viewed him as an old and experienced hand, physically imposing, balding and wise beyond my ken. In reality he was a young man of 26. I was aged 20 but there may as well have been another 20 years between us in terms of the experience of war, life, death and the machinery of war. There was nothing to be done except haul myself to safety. The driver had struggled free and departed the scene. My medical bag sat useless at the top of the slope. Waiting at a safe distance was his friend, Lt ???. My words to him sound daft now but my Afrikaans was limited and all I could say to him was “hy is dood…..baie dood”. He couldn’t stop himself and, despite the danger, ran down the slope to confirm that his close friend was beyond my help, tears flowing. The incident didn’t affect me that afternoon and I ate a hearty meal after finishing my stint at the range. There was hardly a pause and I was back on the evening’s night firing exercise. The Marico sunset was stunning and reliable as ever. We might yet have a war to catch up with if the recent peace failed. It came for us in April 1989. Years later I reflected that one more roll or twitch of that Noddy car and I would have been dead, or a stray spark could have seriously ruined my good looks. I puzzled over fact that I had ran in while others stood like statues. It wasn’t bravery, it was the result of conditioning and a sense of responsibility thrust upon my young shoulders. It would have been bravery if I had paused to consider the consequences and still ran in. But I was just plain stupid. This incident was a minute echo of earlier conflicts, Boer and the World Wars, and the attrition of training and battle on a young generation. 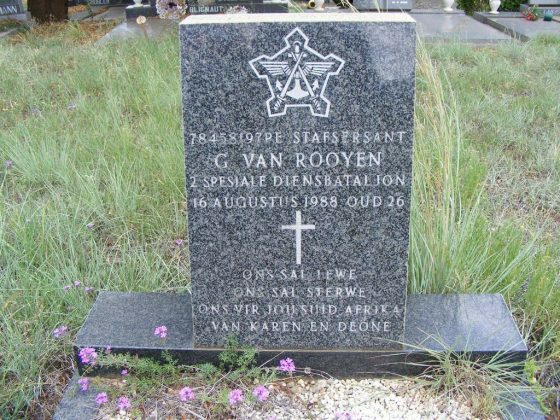 1988 had been a grim year for 2SSB with nine members lost, ranging from the Caleque attack to accidents at Rooisloot and deaths on the road trip home for a weekend pass.